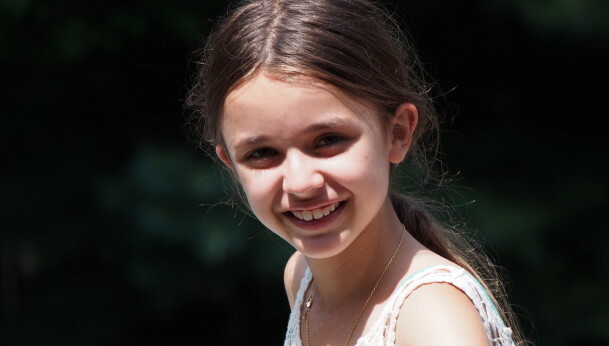 Nine-year old Paloma has to be one of the most adorable little girls in New York City. She loves to read, draw and sing. Her favorite foods include chocolates and carrots. Yes, she’s young but speak with her and you can sense that she has a developed understanding of the world. Last year, she donated some of her favorite toys to kids in Guinea. With the help of her French mom and American dad, she neatly packed the toys for our kids. She also wrote a wonderful letter for them! We were very inspired by Paloma’s kind act. We remember how attached we were to our toys so we wanted to know what inspired Paloma. Get to know Paloma a little more and read about why we are all impressed by her contagious generosity. Why did you decide to work with us and give your toys to children in Guinea? I decided to give some of my toys to children in Guinea because I wanted to give them to children that didn’t have lots of toys. I decided to work with There Is No Limit Foundation because I like that the toys that are given are sent to people who need some. How did you feel when you gave away your toys? When I gave away my toys, I felt a little sad because I wouldn’t get to see them again and I had a lot of fun with them. But at the same time, I felt happy because I knew that the children that would receive them would be happy. What do you hope the toys accomplish for our children? I hope that the toys will bring joy to the children and that they will amuse the children that don’t have many toys. I also hope the toys will be used and well taken care of so that they will last long for all of the children who play with them over the years. What was the best part of giving away your toys? The best part of this experience for me was thinking that the children would like the toys and that they will amuse the ones who don’t have many toys at home. What message do you want to send to our young readers? I’d like to send these two messages to our young readers. First, even if you’re a little sad to give away your toys at the beginning, think about how happy other children will be with your toys. Second, think about those children. Think about the children who have almost zero toys and who spend their whole childhood with only a few toys. How would you feel? What would you wish? Well that’s the way they probably feel and that’s probably what they wish. Favorite games are: Mikado, the Jeu de l’oie, the odor game (you have to recognize different smells without looking at the answer), Hedbanz and Zingo. Favorite Book are: a book in French called “Les quatres filles du Docteur March” (in English: The four daughters of Doctor March) and my favorite series of books are “Groove High” and “Les colombes du Roi-Soleil” (The doves of the King of the Sun) both in French. I also like the book Malory School in French, and Rules in English. I’m a big reader! Favorite Songs are: “Melodies” from Madison Beer, “See you tonight” from Scotty Mcreery, “Diamonds and don’t stop the music” from Rihanna, “Toi plus moi” from Marc Angers, “La danse macabre” from Camille Saint-Säens, “Trouble” from Taylor Swift, ‘’Let it go’’ from the movie Frozen, “Tonight’’ from Enrique Iglesias and “Teenage Dream’’ from Katy Perry.